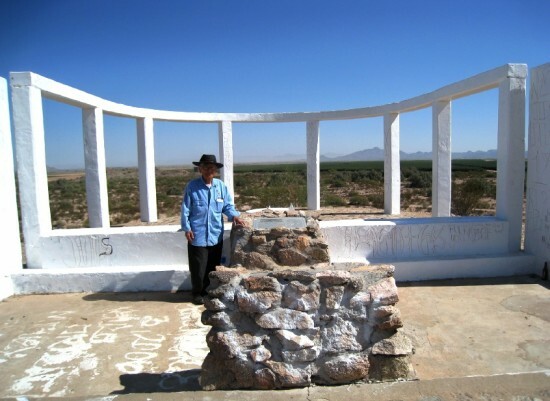 Mas Inoshita at the Gila River monument. 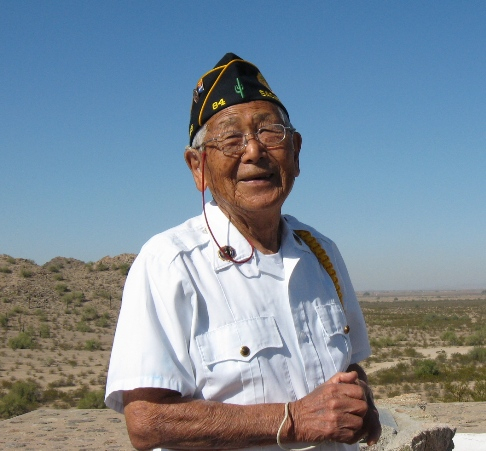 In early November, the beautiful blue skies of Arizona welcomed over 75 people, including nine from the Los Angeles area, to the site of the former Gila River concentration camp for a memorial cleanup in honor of Nisei Masaji “Mas” Inoshita. A number of those in attendance had family members among the 13,000 incarcerated in this desolate land on the Gila River Reservation. The monument was originally dedicated on April 23, 1944 with 458 names of Gila River internees who volunteered to serve or were inducted in the U.S. military. When the camp was closed in November 1945, over 1,100 Gila River internees had entered the military. For several decades, Mas and his good buddy Joe Allman looked after the monument. Jim Kubota served as co-chair of the Gila River Monument Maintenance Committee with Mas. On this fall day, trash and broken glass were picked up around the monument and surrounding area and graffiti was painted over, making sure it continued to remain a fitting tribute to the Nisei soldiers. Local ladies from JACL Arizona Chapter laid a wreath of paper cranes on the plaque that honors the 23 Nisei men from Gila River who were killed in action during the war. After Executive Order 9066, Mas’ family was forced to give up their 55-acre farm, located in Guadalupe. Mas’ family, including his parents and eight siblings, spent three years at Gila River, located south of Phoenix. Mas enlisted in the U.S. Army, joined the Military Intelligence Service, and served as a translator in Burma, India, and China. Mas worked tirelessly to educate everyone from children, college students and to other communities about the camps and the need for diversity of races in the workplaces, schools and in society. He spent most of his adult life as a historian and civil rights advocate. Ted Namba was the principal organizer and the emcee for the program. Ted, an active community leader, organized the cleanup to honor Mas. Ted took over for Mas and Jim Kubota as chair of the Gila River Monument Maintenance Committee six years ago when Mas and Jim wanted to slow down a bit with their activities. The program began with Ken Koshio playing one of Mas’ favorite songs on the fue (flute). Mas’ grandson, Michael Tang, an assistant minister at Arizona Buddhist Temple, spoke about his memories of his beloved grandpa. Many distinguished members from the Gila River Indian Community (GRIC) also spoke. Monica Antone, lieutenant governor of the GRIC, spoke eloquently about how the Gila River Pima children also suffered, just like the Japanese American children at camp, when they were sent there, before the Nisei children arrived. She emphasized the need for each group, Native American and Japanese American, to continue to support each other, and that they are bonded, not only by similar misfortune, but also with an understanding of how important it is to retain our cultures and our heritage, and continue to support each other in the future. Ms. Antone was followed by Mr. Frank Pablo, GRIC District 5 Council member, as well as Mr. Paul Shorthair, GRIC land use ordinance officer, Department of Land Use Planning and Zoning. Mas was a proud member of American Legion Post 84, the Ira H. Hayes Post from Sacaton, Ariz. Post 84, made up mostly of veterans who live in the Sacaton area, was named after Ira H. Hayes, a Gila River Indian Community member and one of the Marines depicted in the iconic sculpture of the raising of the flag over Mt. Suribachi on Iwo Jima. Tony McDaniel, Post 84 adjutant, also spoke. Mr. McDaniel and other post members always made sure that Mas participated in the annual parade held in honor of the Battle of Iwo Jima every February. Mas was a popular participant in the parade with children and members of the Sacaton community cheering for him. Jim Kubota, a Nisei, former Minidoka internee, long-time friend of Mas and co-chair of the Gila River Monument Maintenance Committee, gave a short talk about his experiences spending time at Gila River and the monument site. On a few occasions, when Mas was unavailable, Jim would take former Gila River internees to the camp site. Mas’ daughter, Marilyn Inoshita Tang, spoke about her father’s involvement with JACL, Arizona Buddhist Temple, Post 84, and speaking in classrooms at all levels. She talked about how he received the Martin Luther King, Jr. Servant Leadership Award from Arizona State University, not realizing how prestigious an award it was. 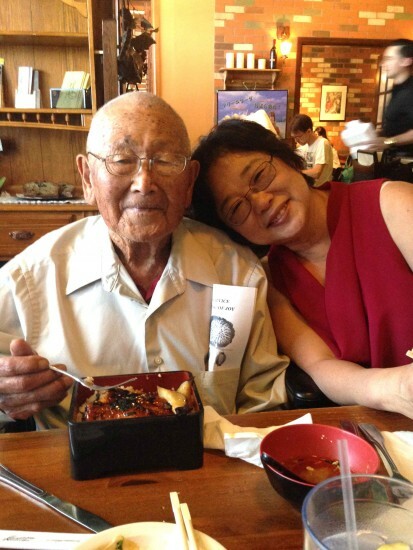 Mas Inoshita and his daughter, Marilyn Inoshita Tang. She recalled one day complaining a bit about all the meetings she had to attend and how busy she was. Mas smiled at his daughter and explained that he didn’t feel the same way. To him, the work they were doing was both an honor and a privilege. Marilyn recounted one final story that perhaps best illustrates Mas’ love for Gila River, which was divided into two camps. She said that after her father passed away in August, the family was going through his things when they found two cans. One can was marked “Dirt from Butte Camp” and the other “Dirt from Canal Camp” along with instructions on what to do with the cans of dirt. Mas asked that after he was cremated, he wanted his ashes to be mixed together with the dirt from both camps. Marilyn and her family honored her father’s wishes. The program ended with Ira Hayes American Legion Post 84 performing “Taps,” followed by a 21-gun salute. Masaji “Mas” Inoshita will never be forgotten. Thanks to Mas, for generations to come, there will be volunteers to care for the monument in his memory. Note: In the exhibit “Common Ground” at the Japanese American National Museum in Little Tokyo, a video titled “Clean-up at Gila River Featuring Mas Inoshita” plays continuously. It shows Mas leading a group of middle-schoolers as they clean up the monument. It also includes interviews with Mas’ grandchildren, Michael and Tracy Tang. Please also note that the Gila River monument site is on private land of the Gila River Indian Community. JACL Arizona Chapter has a permit with GRIC to allow for occasional monument site clean-up projects. No one is allowed to go on the land without prior approval from GRIC.